Summary: Learn how to paint the exterior of a house, paint with masonry paint, paint with cement paint, paint using a roller and paint using a spray gun. Painting the outside of a house not only improves the look of the property but will also protect against the elements. Most houses will require re-painting every five or six years. It is a large project, so plan carefully and choose a dry spell to carry out the work. It is advisable to divide the project into manageable stages, especially if you are working on your own. Start by painting woodwork around the roof, and then move on to guttering, house walls, brick walls, windows, tiled sills, and finally any weatherboarding. Surfaces must be prepared at least two weeks before the painting is due to start. Existing paint must be stripped and any repairs to the walls carried out. Also check that gutters and downpipes are secure, and that the putty around windows is sound. Divide the walls into sections that can be completed in one painting session, using window frames, doorframes, bays, downpipes and corners of walls as break points to disguise joins. You should start painting at the top of the house and, if you are right handed, work from right to left. To calculate the quantity of paint needed for the walls you need to first calculate the surface area of the walls: height of the wall x length of the wall. The easiest way to measure the height of the walls is to climb a secured ladder to the highest point on the eaves with a ball of string. Holding the end let the ball of string drop to the ground. On returning to the ground measure the length of the string. The area that 1 litre of paint will cover should be on the paint tin label. Remember that rough walls will need more paint than smooth ones. The area that 1 litre of paint will cover should be on the label of the paint tin. Use this figure to calculate the quantity of paint needed. The most common paint to use is exterior grade emulsion or masonry paint for walls and exterior grade gloss paint for woodwork and metal. If painting bare wood you will require primer or undercoat, unless using a microporous paint. If your guttering and pipes are coated in bitumen paint, you must apply an aluminium primer-sealer before applying gloss paint. 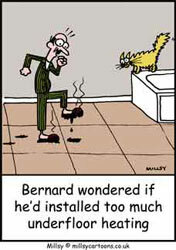 Alternatively, use another bitumen paint. To check for bitumen paint, run a petrol-soaked rag over the surface. If the paint is bitumen, the cloth will be stained brown. Masonry paints are available as water-based, solvent-based or reinforced. The majority of masonry paints are water-based and contain additives to prevent unwanted mould growth, making them ideal for outside use. Two coats should provide adequate coverage. For use on porous walls, it is advisable to weaken the mix by adding 20% water and apply more coats. Avoid painting in damp or humid conditions. Solvent-based paint is water vapour permeable, allowing brickwork to ‘breathe'. The paint can be thinned using 15 per cent white spirit, but always check the manufacturers recommendations first. The solvent-based paint can be applied in most weather conditions except rain. Reinforced paint consists of powdered mica or fine aggregate, which dries to produce a textured, highly weatherproof finish, essential in coastal regions or rough climates. You can vary the texture of the finish according to taste. Cement paint comes in the form of pigmented dry cement to which water is added. It is one of the cheapest options for exterior painting. Porous surfaces should be sprayed with water, and covered with two coats of paint. Mixing instructions should come with the product, as a rough guide mix 2 parts powder to 1 part water in a bucket, stirring to a smooth creamy paste. The paint will begin to dry after an hour so only mix up enough for the section you are painting. Use a paintbrush between 100mm to 150mm wide. This is the most effective size because any bigger and it will soon become tiresome, and any narrower and it will take much longer, due to smaller coverage. The best type of brush for rough exterior walls is one with coarse bristles, which last longer. The best technique for painting is to crisscross your strokes to give an even application of paint. When painting up to a feature such as a doorframe or windowsill you need to adjust your painting technique depending on the texture of the walls surface. For example, if the surface is smooth you should be able to paint a reasonably straight edge following the line of the feature. However, rough, heavy textured walls will require a different brushing technique. A good way is to use the tip of the bristles and apply paint in a gentle scrubbing action, and then smooth the paint outwards from the feature so it is evenly spread over the surface. When you reach pipes on the wall, which form an obstruction, a good way to protect them from the paint is to wrap some newspaper around them. You can then paint behind them and as you move down the wall, slide the newspaper down as you go. On surfaces such as pebbledash, the surface is so uneven that ordinary brushes will simply not cope with the unevenness. The best brush to use is a banister brush. Just pour the paint into a roller tray, and cover the bristles sufficiently without overloading, then apply it onto the wall using circular action strokes working it into the uneven surface. Another, more efficient method of painting masonry, is to use a paint roller. Rollers apply paint three times faster than a brush making them the more popular choice for painters. Paint rollers can wear out very quickly on exterior walls, so make sure you are using the correct type. For example heavy texture walls require a long-pile roller, whereas smoother texture walls require one with a medium pile. It is advisable to have a spare roller sleeve to hand in case one wears out faster than anticipated. The technique for painting with rollers is to vary the stroke angles so that there is an even coverage and so the stroke marks don't show. Any areas of wall too difficult to get at with the roller can be done with a brush. When using rollers, you also need the paint tray. This can be difficult to get at when you are up on a ladder, so a popular idea is to set up a platform on which to work. The most effective and efficient method of applying paint is to use a spray gun. However you need to do more preparation beforehand. This includes masking off areas and objects you don't want painted using newspaper and masking tape. Always wear a respirator when spraying. The paint will need to be thinned by about 10 per cent. Set the gun to the appropriate instructions, depending on the particular paint being used. When you are ready to start spraying, the best distance to hold the gun is approximately 225mm from the walls surface. To ensure an even finish, keep the gun moving in parallel strokes. Slightly overlap each pass, keeping the gun nozzle pointed directly at the surface. As you are going along, the best spraying technique is to trigger the gun just before each pass, then release it at the end of the stroke. To spray external corners, spray directly at the apex of where the walls meet. This way you ensure that both walls are getting an even coverage. However, when two walls meet to make an internal joint, each wall surface should be treated separately.